Ryan Reynolds stars as Deadpool in Twentieth Century Fox’s DEADPOOL 2. ©20th Century Fox. Moviegoers feeling burned out by the abundance of superhero movies hitting theaters as of late likely are still looking forward to 20th Century Fox’s “Deadpool 2.” After all, its 2016 predecessor was a welcome breath of fresh air in a market saturated with superhero flicks. An action-packed, R-rated superhero film, the original “Deadpool,” based on the Marvel comic book title of the same name, didn’t take itself too seriously, yet still delivered all of the excitement of its blockbuster Marvel/DC cinematic counterparts. Ryan Reynolds was clearly born to play Marvel’s “Merc with a Mouth,” and while comical superhero movies have grown to become standard fare as of late (see fellow Marvel hits “Guardians of the Galaxy Vol. 2” and “Thor: Ragnarok”), “Deadpool” remains in a league of its own thanks to its nonstop meta humor. “Deadpool 2” continues to poke fun of itself and the superhero genre, although sometimes the jokes seem a bit forced the second time around. Not to say that the eagerly anticipated sequel, directed by David Leitch (who also directed Celine Dion’s music video for the film, “Ashes”), isn’t a blast—it is—it just sometimes feels as though “Deadpool’s” original screenwriters Rhett Reese and Paul Wenick, joined this time by Reynolds himself, are trying way too hard to be funny. Without spoiling anything, “Deadpool 2” focuses on the wisecracking superhero—now an “X-Men Trainee”—trying to get his heart in the right place by saving a young mutant named Russell (Julian Dennison, “Hunt for the Wilderpeople”) from exacting revenge on the mutant-hating man who abused him, thus turning to a life of crime. After realizing the hard way that his own tactics don’t necessarily line up with the noble X-Men’s way of handling things, Deadpool creates his own “family” of superheroes—the X-Force—to stop the time-traveling Cable (played by Josh Brolin, a.k.a. “Avengers: Infinity War’s” Thanos) from killing the misguided mutant to protect his own family in the future. Along the way, there’s plenty of blood and plenty of laughs as Deadpool goes on a self-reflective and ultimately selfless journey to save Russell—and outdo 2017’s R-rated superhero drama “Logan” in the process. As any Deadpool fan knows, there’s been a longstanding rivalry between Deadpool and the X-Men’s Wolverine since Reynolds first played Deadpool in 2009’s “X-Men Origins: Wolverine,” and “Deadpool 2” doesn’t waste any opportunities to knock down Hugh Jackman’s iconic superhero character whenever it can. These natural comedic moments are when “Deadpool 2” shines the brightest, though, with Deadpool even going so far as to calling Cable “Thanos” in one scene. Still, not every snide comment Deadpool makes rolls off of his tongue effortlessly. Quite a few jokes fall flat, breaking up the pace of the movie. Furthermore, several of the film’s surprise cameos go by in such a rush, audience members don’t have the time to process whose famous face just graced the screen. This is a shame since the cameos are truly great for those with sharp enough eagle eyes to catch them all. 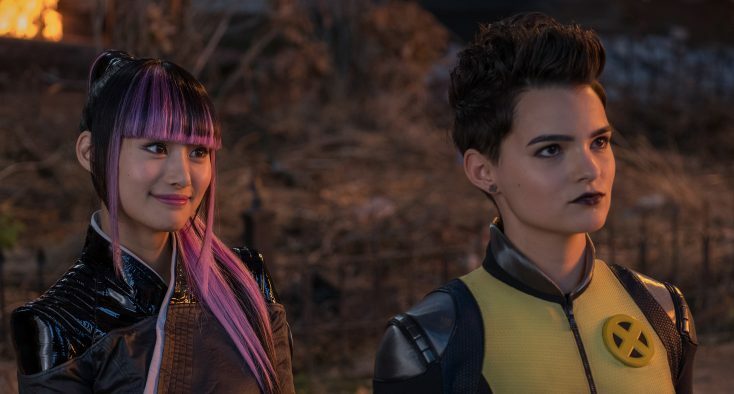 Reynolds once again plays the titular character perfectly, although it would have been nice if his “Deadpool” costars Brianna Hildebrand (Negasonic Teenage Warhead) and Stefan Kapicic (Colossus) got to share more screen time with him. Most of “Deadpool 2’s” supporting players aren’t given a lot of screen time to shine, which is unfortunate, but “Atlanta’s” Zazie Beetz manages to steal the spotlight whenever she can as X-Force’s lucky mercenary recruit, Domino. “Deadpool 2’s” soundtrack is also spot-on, mixing everything from Dolly Parton to dubstep. Audiences may no longer buy physical CDs much anymore, but similar to the first “Guardians of the Galaxy,” ticket holders will leave the theater wanting to at least download the catchy soundtrack. The ludicrous placement of certain songs in certain scenes also helps make the film even more enjoyable, resulting in some of the biggest laughs in the movie. In keeping with the tradition of most Marvel films—be it Fox or Disney—“Deadpool 2” has a couple of scenes that run during the end credits fans won’t want to miss. In particular, the mid-credits extra might just be the funniest sequence in the entire movie and is easily worth the price of admission alone. The film’s music also comes into play at the end of the credits, teasing a villainous return in the future. Ultimately, while “Deadpool 2” may not be as strong as its predecessor, it is that rare sequel that comes pretty darn close. Even with a few missteps, fans of the franchise will enjoy the film and be eagerly anticipating where Marvel’s beloved, foul-mouthed hero goes next.